Looking for a Reliable Home Appraisal in Jersey Village, TX? Our Texas certified appraisers are the leading providers of independent residential and commercial real estate appraisals in the Jersey Village market area. We strive to deliver an appraisal service that meets our clients expectations and is delivered with an industry leading turn time. Not only do we deliver our reports faster than most other appraisal companies, we maintain some of the lowest costs for appraisal services in the area. Whether you need a property value report for lending, private use or a legal matter, our appraisal services can accommodate most real estate valuation requirements. We are dedicated to providing competent, courteous and prompt services to all our clients be it homeowners or industry professionals. If you’d like to discuss your appraisal needs in more details please contact us via the phone number on this site or the online contact form found above. 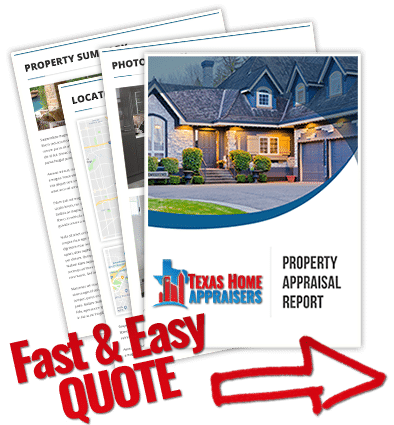 Do you need a independent real estate appraisers in Houston Texas today? Call the #1 appraisal company or use the online quote form and a member of our staff help you shortly. No. Only home inspectors would be required to physically examine the roof. If the appraiser notes anything that may influence value, positive or negative, they will include it within the report. The appraiser is required to list any possible issues they may see with the roof which could require a second inspection by a competent professional. Will my appraisal report be seen by the property tax authority? Absolutely not! Only appraisals initiated by request of a lender(bank) on behalf of lending, will be made public knowledge and shared with local tax authorities. A professional appraisal is a powerful tool in the process of contesting your property tax values. What if a home appraises for more than the sales price? For a lender transaction a higher appraisal will have no impact on your loan at all because lenders use the lower of the appraisal value or the sales price to determine loan details. It would only impact you if the value came in lower than your sales price because now your loan number would need to be re-worked. The good news is that you now have built in equity in the home. You should also be aware that the seller is not given a copy of the appraisal so they will never know that it came in higher than the sales price. While the appraisal value you receive is good “as of” the date of the appraisal, values change as the market changes. Exactly how long your opinion of value will remain accurate depends on the market conditions. For lending situations your bank will not accept any comparable sales that are older than 6 months. Most banks and lenders require that an appraisal be no older than 60, sometimes 90 days to be acceptable.